We’re counting down the days to our favourite time of year, when festival season finally kicks off again. With so many amazing festivals heating up the UK, this summer’s set to be another absolute scorcher. To help pick the best festival for you, we’ve put together a handy 2019 festival guide. 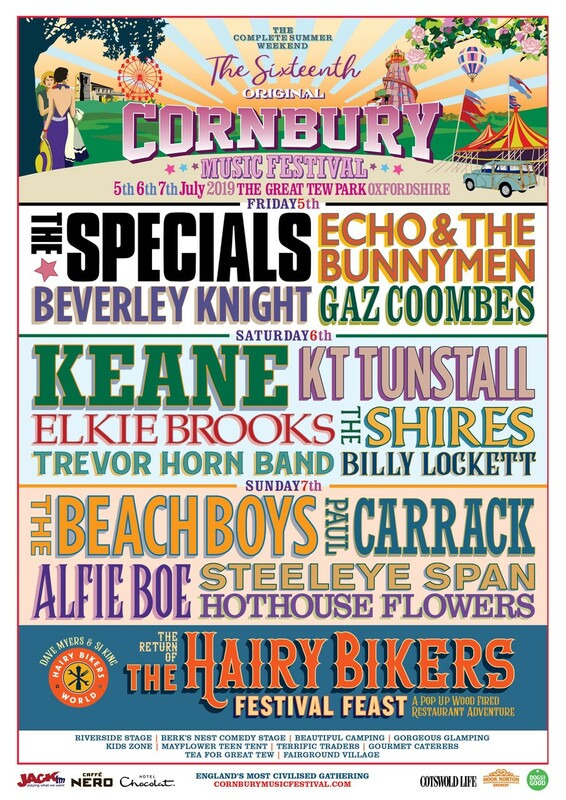 The family friendly Cornbury Festival returns for its 16th year, with another legendary lineup. Festival goers can expect to see Keane, The Specials, The Beach Boys, Echo & The Bunnymen, KT Tunstall, Beverley Knight and more. The Hairy Bikers also make their return, with their festival feast pop-up wood-fired restaurant adventure… Delicious! Looking to attend your first ever camping festival? Look no further than Leeds Festival. 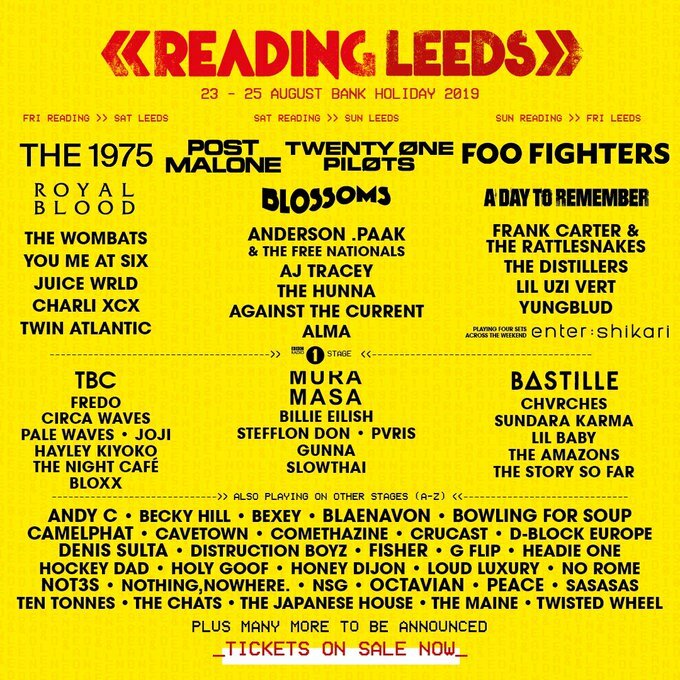 The lineup includes The 1975, Post Malone, Twenty One Pilots, Blossoms, Foo Fighters, Royal Blood, A Day To Remember and lots more. Whether you’re just finishing your GCSEs, A-Levels or have just never braved a festival before, we think this is for you. 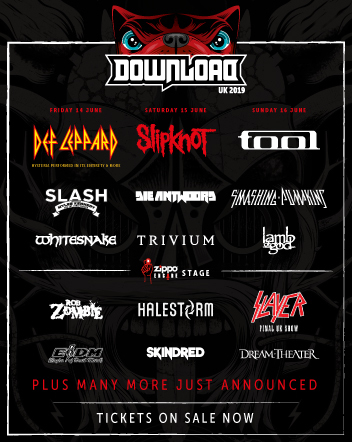 Download Festival is renowned as being the UK’s premier rock festival and this year’s acts certainly don’t disappoint. Def Leppard, Slipknot, Tool, Slash featuring Myles Kennedy & The Conspirators, Die Antwoord, Smashing Pumpkins and more play across the weekend. And WWE NXT UK will be taping there for the first time ever. Music, comedy, activities and incredible food, this festival has it all. 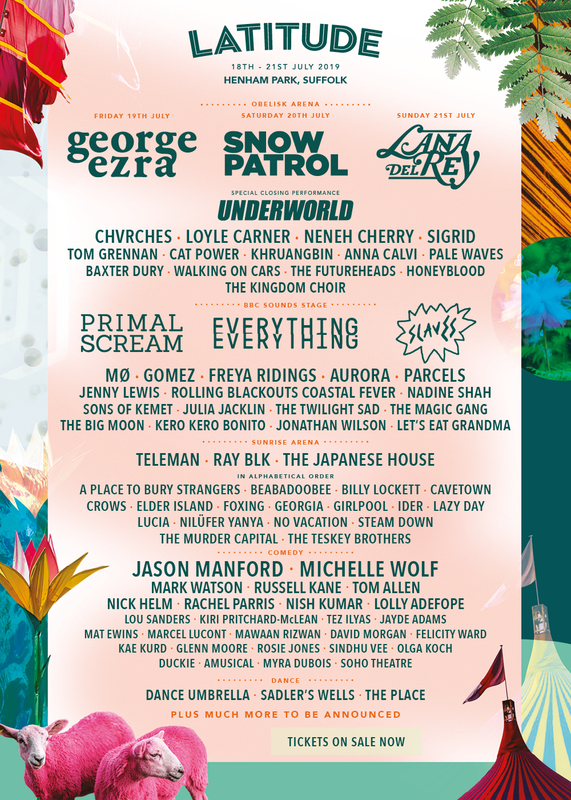 Artists include George Ezra, Snow Patrol, Lana Del Rey, Underworld, Primal Scream, Everything Everything and Slaves. And there’s an epic comedy lineup – Jason Manford, Michelle Wolf, Market Watson, Russell Kane and Tom Allen will all perform. There will also be dance performances, lake swimming and a sanctuary space. Leave your tents at home, here are our favourite festivals in cities and towns. Now in its second year, Neighbourhood Weekender returns to Warrington with two days of music. This year will see George Ezra, Primal Scream, You Me At Six, Nothing But Thieves, Tom Grennan and more play on the Saturday. 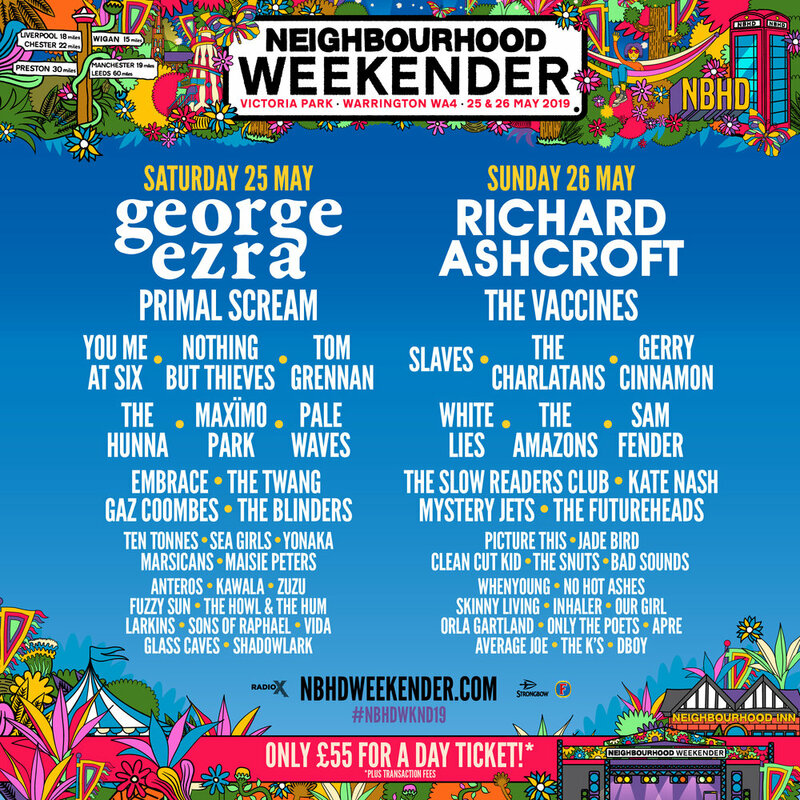 And on the Sunday, Richard Ashcroft, The Vaccines, Slaves, The Charlatans, Gerry Cinnamon, Sam Fender and more will play. 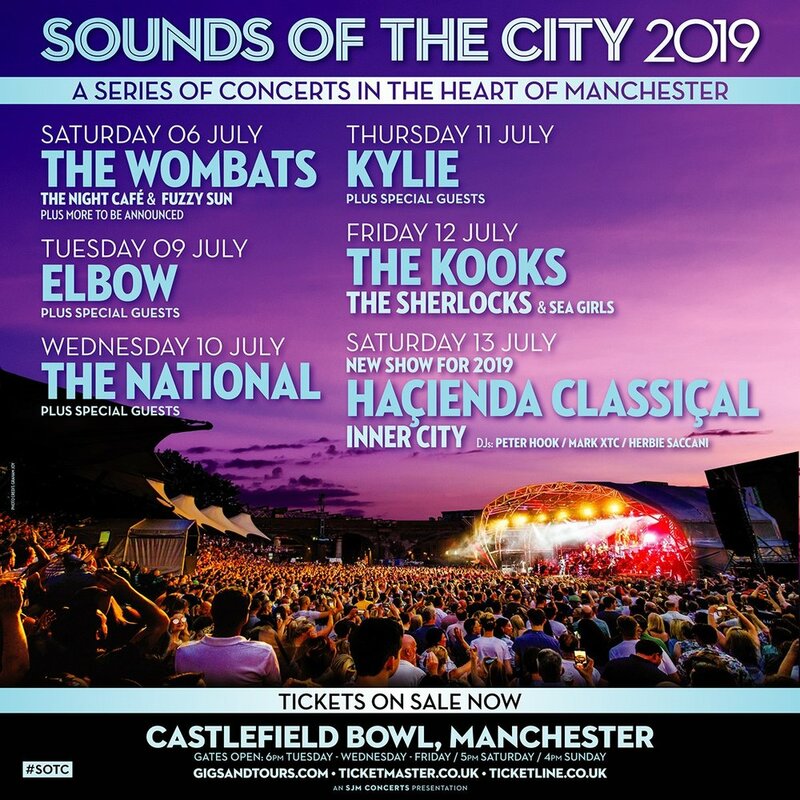 Sounds of the City is back, taking over Manchester's Castlefield Bowl this summer. There’s headline shows from Bloc Party, The Wombats, Elbow, The National, Kylie Minogue, The Kooks and Hacienda Classical. Camden Rocks festival sees 400 bands play across two venues over two days. Frank Turner, Deaf Havana, Ash, Rat Boy and Wheatus are just a few of the acts lined up to play. This is the perfect festival if camping, wellies and portaloos aren’t for you. Now in its 10th year, Lytham Festival brings you music by the seaside. This year includes shows headlined by The Human League – who open the Birthday celebrations – and the Stereophonics. British Summer Time Hyde Park returns in 2019 – with a headline show from Florence + The Machine, joined by special guests Lykke Li, Khruangbin and Nadine Shah plus more to be announced. Kubix Festival’s Friday lineup is a throwback to the ‘90s, and sees The Outhere Brothers, 5ive, S Club, Snap, Technotronic, Whigfield, 911, Artful Dodger and Lou Bega play. Sunday has an indie throwback lineup, with The Stranglers, Echo and the Bunnymen, Peter Hook & the Light, Embrace, Cast, Black Grape, The Alarm, Big Country, The Farm and more taking to the stage. We can’t think of a more beautiful festival setting than Blenheim Palace, a World Heritage Site with over 300 years of history. Nocturne Live is a series of summer concerts held in the beautiful grounds. There’s shows from Gladys Knight, Disco Classical plus Kathy Sledge and Gabrielle; Ms. Lauryn Hill, Laura Mvula and Mahalia; Tears for Fears, White Lies, Scritti Politti; and Kylie Minogue, Sophie Ellis-Bextor and Hackney Colliery Band. Paying tribute to all your favourite music icons, past and present. Wannasee Festivals has the greatest tributes to the greatest artists. You’ll be singing along to non-stop classics all day, with tributes to The Beatles, Tina Turner, Blondie, Queen, Pink, Spice Girls, ABBA and more. The UK’s largest celebration of country, Americana and roots music returns to Stanford Hall, Leicestershire in September. There’ll be performances from the likes of Josh Turner, Kip Moore, Asleep At The Wheel, John Paul White, Eric Paslay, Morgan Evans and Rhiannon Giddens. With songwriters’ rounds, a wellness area, a classic American car display, traditional Southern-style food stalls and dedicated kids area. 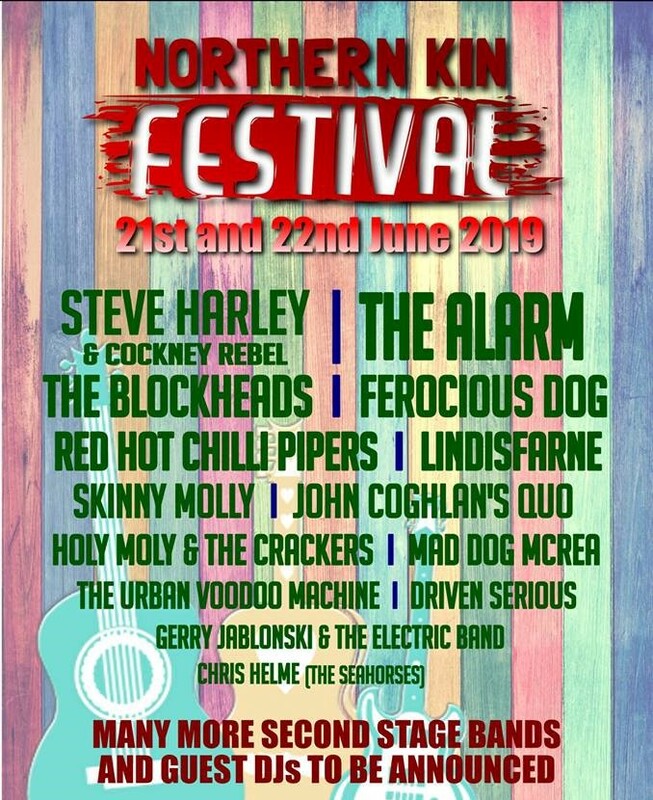 The festival returns to Stanhope, County Durham in June – catch The Alarm, Steve Harley & Cockney Rebel, The Blockheads, Red Hot Chilli Pipers, Ferocious Dog, Lindisfarne and more; set in the beautiful surroundings of the Castle Gardens. Beacon Festival in Oxfordshire is a not-for-profit family-friendly festival. It celebrates ale, music and has workshops, with plenty to keep the kids occupied. Wireless Festival is the UK's biggest urban music festival, selling out almost instantly again this year. Another incredible lineup, with some huge names including Cardi B, Migos, Tyga, Tory Lanez, Travis Scott, Future, A$AP Rocky and more. Innervisions Festival returns to London, with a stellar line up of soul, funk , jazz and blues musicians playing in different venues across London. Aloe Blacc, Jarrod Lawson, Janet Kay & Carroll Thompson, Monday Michiru and more will play. From Circus to Comedy, Family, Cabaret and Variety, The Underbelly, South Bank has it all. 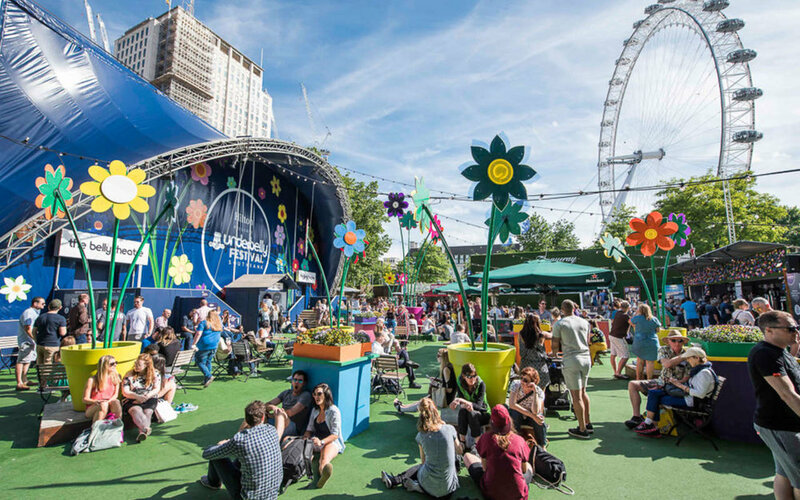 The pop-up festival brings you world class entertainment, with international street food and bars it creates a festival vibe on the banks of the Thames. And the majority of tickets under £20! Bloodstock Open Air Festival is the UK’s biggest independent metal festival. Boasts over 100 international rock and metal acts across four stages, including; Sabaton, Parkway Drive, Scorpions, Powerwolf, Dimmu Borgir, Anthrax and more. Get tickets for all these festivals and more!